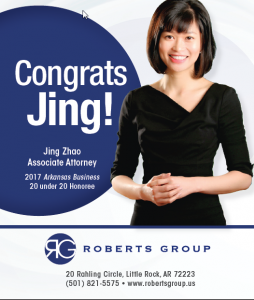 September 2017: Jing Zhao, Director, Business Growth & Strategic Alliances – China, was chosen as one of this year’s Arkansas Business’ 20 in their 20’s , The New Influentials, an exclusive group of up-and-coming young professionals who are making their mark on the Arkansas business community. It is a tremendous honor, not only to be nominated, but to be chosen as a member of this elite group! 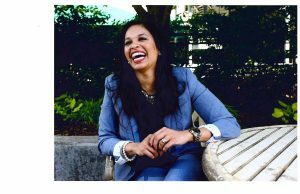 June 2017: Congratulations to Kathy Alexander, Advisor to Roberts Group, upon her election to Summit Utilities Inc., Board of Directors. 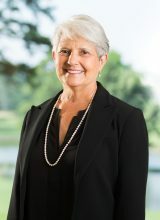 Roberts International pictured with U.S. Ambassador to Vietnam Ted Osius and Vietnamese Prime Minister Nguyen Xuan Phuc. Today, U.S. Secretary of Commerce Wilbur Ross met with Vietnamese Prime Minister Nguyen Xuan Phuc to discuss the deepening economic relationship between the United States and Vietnam. The leaders also attended a ceremony to recognize 13 new business deals worth more than $8 billion. “President Trump is prioritizing engagement with Vietnam, an important trading partner of the United States,” Secretary Ross said. “Today’s deals will expand our cooperation in multiple sectors, supporting U.S. exports and creating economic growth in both countries. 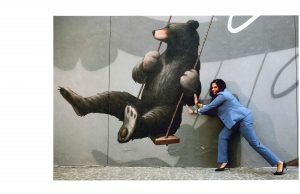 They will also help the U.S. reduce our trade deficit with Vietnam. The deals announced today include more than $3 billion in U.S.-produced content, which collectively support more than 23,000 jobs. 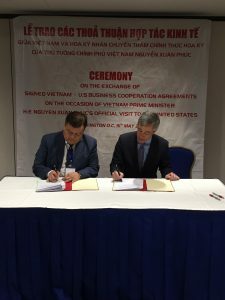 The commercial deals between the United States and Vietnam feature a variety of organizations, companies, and industry sectors. During their meeting, the leaders discussed trade policy priorities that have an important role in the economies of both countries. The United States is Vietnam’s largest export market, and Vietnam is the United States’ fastest growing goods export market. 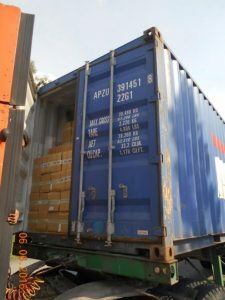 U.S. goods exports to Vietnam reached $4.4 billion in 2016, increasing by 77 percent from 2014. “The growth of the middle class and the increasing purchasing power in Vietnam are further incentives to strengthening our long-term trade and investment relationship,” continued Secretary Ross. Secretary Ross affirmed Commerce’s commitment to strengthening U.S.-Vietnam economic ties. In particular, Secretary Ross stressed the importance of leveling the playing field for U.S. exports to Vietnam, reducing the U.S. trade deficit with Vietnam, and resolving market access barriers for U.S. companies. 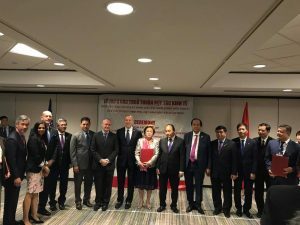 Following their meeting, Secretary Ross and Prime Minister Phuc attended the ceremony where the more than $8 billion in deals were finalized between U.S. and Vietnamese entities. GE signed energy and aviation agreements worth nearly $6 billion dollars, with $3.4 billion in U.S. content and, based Department of Commerce estimates, these deals will support 17,680 U.S. jobs. Honeywell signed an aviation agreement worth over $100 million. Murphy Oil Corporation signed a deal worth $16.5 million, supporting approximately 20 U.S. jobs. Passport Systems, Inc. signed a deal worth $1 billion, with $420 million in U.S. content and supporting approximately 1,000 U.S. jobs. Hilton signed a deal worth $650 million to manage a 610-room dual-branded hotel in Vietnam. Nicklaus Design signed a design deal for 10 golf courses in Vietnam. The total development cost of the deal will exceed $260 million. UPS signed a Mutual Collaboration Understanding to collaborate on capacity building with SMEs. 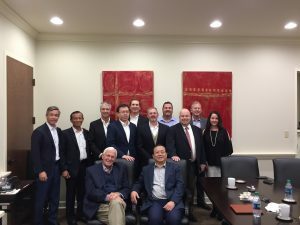 Caterpillar signed a Memorandum of Understanding for technology collaboration with its dealer in Vietnam to support generator sets made and exported from Lafayette, Indiana. 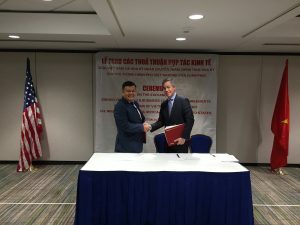 Arizona State University signed a Letter of Commitment to collaborate with Vietnam’s Ministry of Science and Technology on research and academic programs. UPMC (University of Pittsburgh Medical Center) signed a collaboration agreement to provide radiation oncology-related services. Other entities that participated in the event were Varian Medical Systems, Silicon Specialists, Inc. and Roberts International. 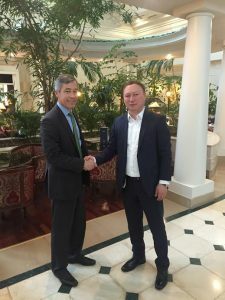 Mike Roberts, Chairman and CEO of Roberts International signed two agreements with the Mr. Tran Dinh Quyen, Chairman of Tin Thanh Group, on the development of infrastructure and energy projects in Vietnam. 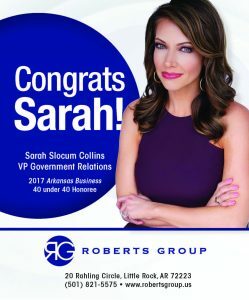 April 2017: Sarah Slocum Collins, VP Government Relations, was chosen as one of this year’s Arkansas Business’ 40 under 40 Honorees, a distinguished group of business and community leaders who are making their mark on the Arkansas business landscape. This is a tremendous honor, not only to be nominated, but to be chosen as a member of this elite group! 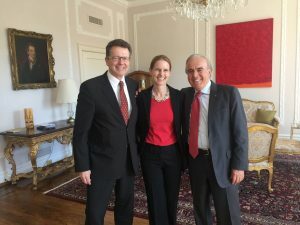 March 29, 2017: Ambassador Dimitrios Tsikouris with the Ambassador of Austria, Wolfgang Waldner and his wife Gudrun. 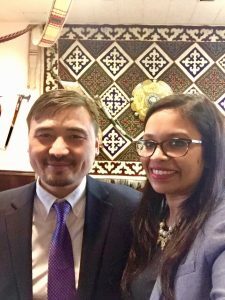 March 20, 2017: Safiya Ghori-Ahmad of Roberts International with Nurgali Arystanov, Political and Trade Counselor at the Embassy of Kazakhstan. 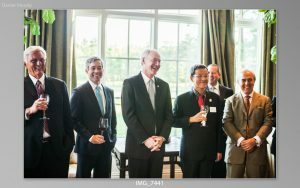 March 17, 2017: Former Governor of Arkansas, Mike Beebe and Governor of Arkansas, Asa Hutchinson with Dinh Quoc Thai, Chairman of the Dong Nai Peoples Committee, and Ambassador Dimitrios Tsikouris and Mike Roberts of Roberts Group, celebrating the Sister State Business Relationship between Arkansas and Dong Nai Province, Vietnam, June 28, 2015. 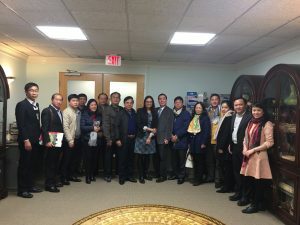 January 9, 2017: The Embassy of Vietnam in Washington, DC hosts Safiya Ghori-Ahmad of Roberts International to meet with Vietnamese companies to discuss market entry strategies. December 2016: Roberts International helped facilitate the sale of LED lights from Curtis Stout to Tinnghia Corporation in Dong Nai Province, Vietnam. Pictured above are representatives from Roberts Group, Curtis Stout, Cree Lighting, and TInnghia Corporation. December 8, 2016: Sarah Collins pictured with Geert Albert Bourgeois, Minister-President of Flanders and Flemish Minister of Foreign Policy and Architectural Heritage. 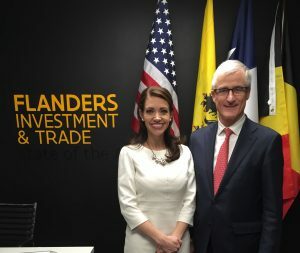 December 8, 2016: Sarah Collins of Roberts Group attending a reception for the Flanders Trade & Investment Mission trip to Houston. 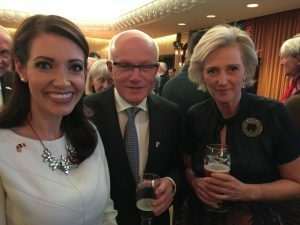 Sarah is pictured with Ambassador Wouters and HRH Princess Astrid of Belgium. 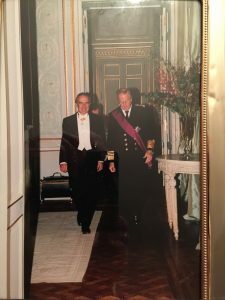 Ambassador Tsikouris, on the occasion of presenting his credentials to King Albert of Belgium in 2005. 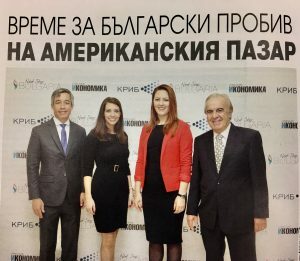 October 24, 2016: Mike Roberts, Sarah Collins and Ambassador Dimitrios Tsikouris of Roberts International with Iva Loukarsky of Next Stop: Bulgaria in Sofia, Bulgaria where the team conducted a seminar for Bulgarian companies seeking US market entry. October 13, 2016: Roberts Group is a proud sponsor of the Arkansas Woman of Inspiration 2016 Luncheon at the Statehouse Convention Center, honoring Mrs. Johnelle Hunt for her commitment to child welfare and the important work of Children’s Advocacy Centers of Arkansas. 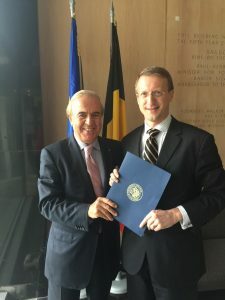 September 29, 2016: Ambassador Tsikouris, Foreign Affairs Advisor for Roberts Group hand delivering a letter of invitation from Arkansas Governor Asa Hutchinson to Mr. Thomas Lambert, Deputy Chief of Mission to the Belgian Embassy in Washington, DC, inviting a trade delegation from Belgium to visit Arkansas in December 2016. 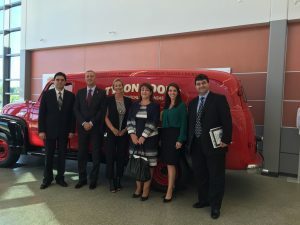 September 14, 2016: Roberts International and government officials from Bulgaria meeting with Tyson Foods. Pictured here are Ambassador Tihomir Stoychev, Minister of Economy Bojidar Loukarsky, Beth Pautsch of Tyson Foods, Director of Foreign Economic Policy Diyana Naydenova, Sarah Collins of Roberts International, and Commercial Counselor and Trade Attache of the Embassy of the Republic of Bulgaria Ivo Konstantinov. 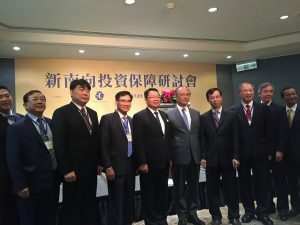 September 13, 2016: Business Development conference for Tin Nghia in Taipei. Tin Nghia Corporation, Vietnam, is a client of Roberts Group. 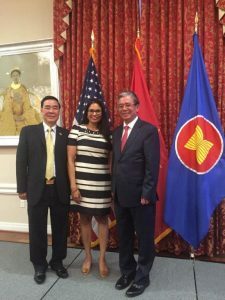 September 2, 2016: Safiya Ghori-Ahmad representing Roberts International on the occasion of Vietnam’s National Day. Pictured with the Vietnamese Ambassador, His Excellency Pham Quang Vinh and Mr. Dao Tran Nhan, Trade Minister at the Embassy of Vietnam. 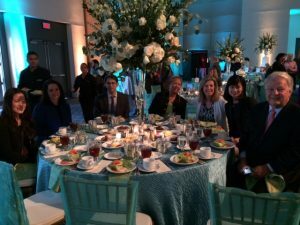 August 27, 2016: Roberts Group is an official sponsor and affiliate of the American Association of Physicians of Indian Descent (AAPI) of Arkansas, and participated in the AAPI annual dinner. 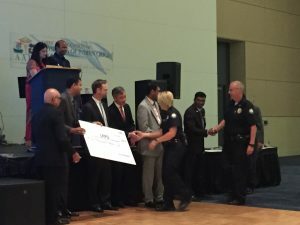 Photographed above are Rajesh Chokhani, VP of Welspun USA, Dr. Greg Bledsoe, Arkansas Surgeon General, Mike Roberts, and Dr. Srini Ramaswamy, President of AAPI. 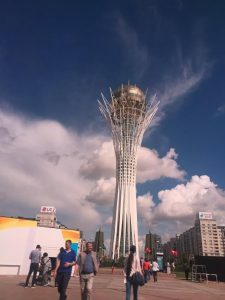 July 4, 2016: Mike Roberts at the Atameken Chamber of International Commerce of Kazakhstan as Roberts International agrees to represent Kazakhstan in the US. 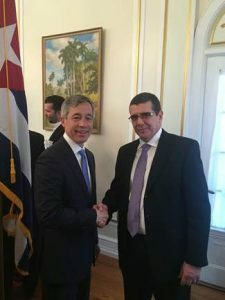 June 22, 2016: On their July trip to Cuba, the Roberts International team meets with Cuban Ambassador José Cabañas. 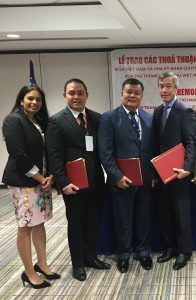 June 2016: The Roberts International team successfully negotiated the sale of LED lights from Curtis H. Stout to Tin Nghia Corporation of Dong Nai province. 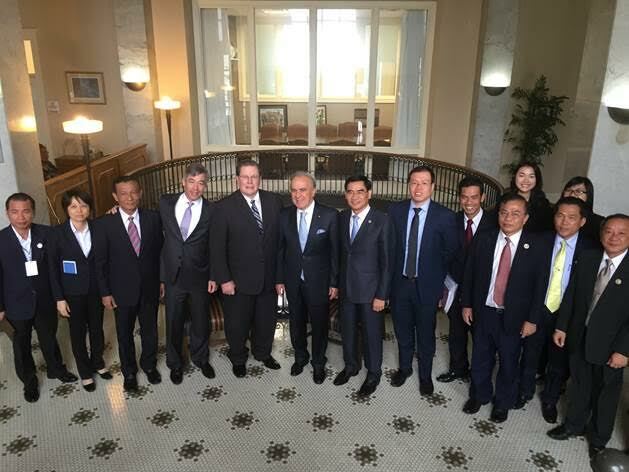 Roberts International works with US companies to help them expand into major emerging markets, while assisting Vietnam move towards more sustainable energy solutions. June 2016: Roberts International successfully negotiated the sale of Tin Nghia Corporation’s cashews to Whole Foods. 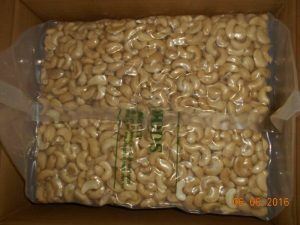 Dong Nai province is now sourcing cashews for Whole Foods’ 365 label. 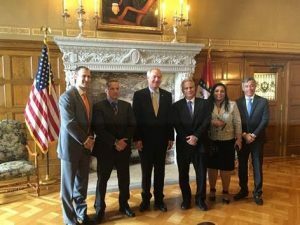 April 11, 2015: Arkansas’ Governor Asa Hutchinson and Mike Roberts meet with a delegation from Cuba.